Hauling our roller bags and Paul’s big golf bag, we hiked a half mile from our hotel to get our rental car this morning. Unlike our hike from the train station two days earlier, the sun was shining and the sidewalks were pretty empty. After we got our rental car, and Paul felt acclimated to driving on the left side of the road, we headed to the Lake District, an area of England that has always seemed romantic and mystical to me. 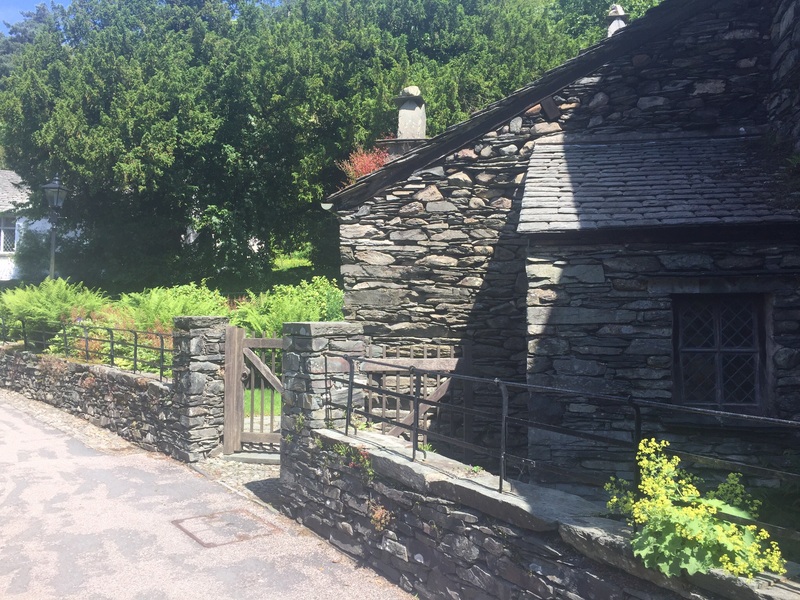 Our first stop was the Wordsworth Museum and Dove Cottage, poet William Wordsworth’s home for the nine most productive years of his career. Ever since he became my favorite poet in college ( I even named my English setter after him), I have dreamed of going to the Lake District and spending time where Wordsworth lived and worked. We waited for our scheduled tour in his little cottage garden. It was hard for me to believe that I was actually walking through his home and seeing the furniture he used. Although some of the other buildings around Dove Cottage were contructed later, during the Victorian era, we enjoyed strolling the grounds and experiencing the cozy settlement. From there we drove about thirty minutes to Hawkshead, the home of Beatrix Potter, creator of The Tale of Peter Rabbit. 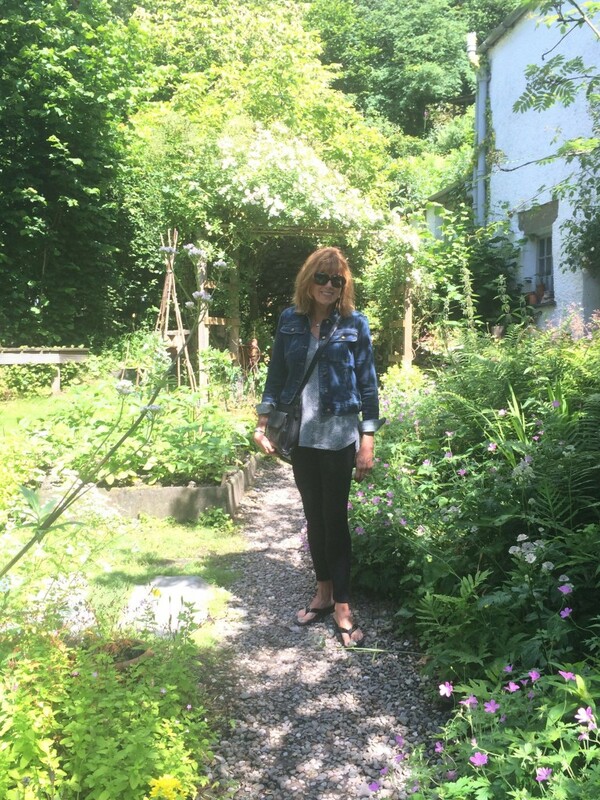 We took a few wrong turns on the very narrow, curvy roads, so we only had time to stroll around the quaint village. Paul did a fabulous job driving on the little roads framed by old stone walls. One time we came nose to nose with a tour bus on a road that was not wide enough for both of us. The courteous bus driver backed up a bit, and we were able to squeeze by. I was pretty amazed to see how many people bike these narrow roads. There are no bike lanes or even shoulders; there is barely enough room for two cars to pass. The bikers must really trust that the car drivers are watching out for them. 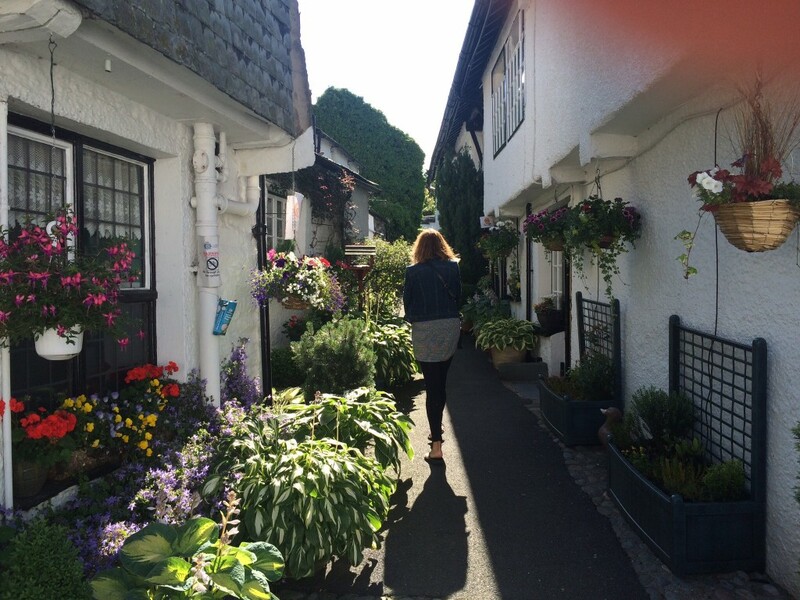 With the wonderful assistance of google maps, we arrived at our B and B in Keswick. 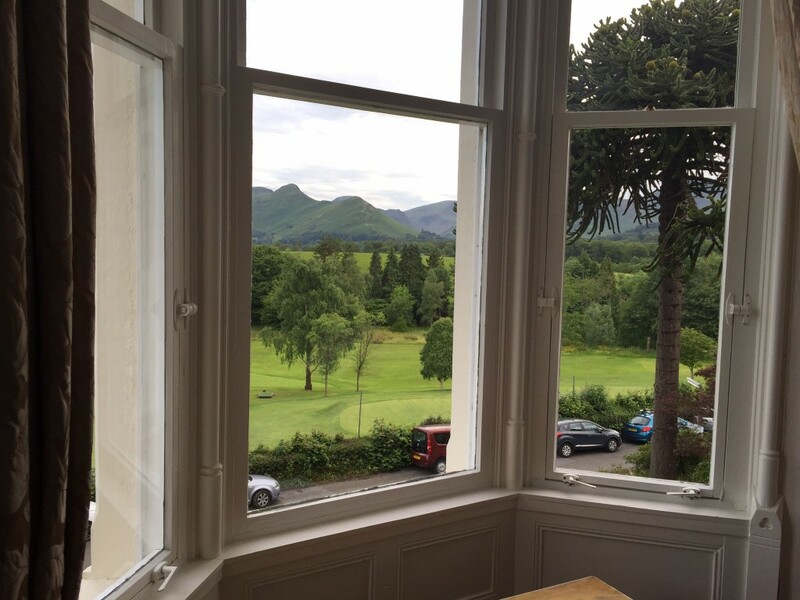 Our front window gives us a great view of a little golf course, the hills and the lake. After our tiny room in York, we are looking forward to having a bit more space.